You can import data into any roster or tournament. Load the program you are transferring information from. Save your golfers in an ASCII delimited text file. Review the documentation of the program you are using to see how to do this. 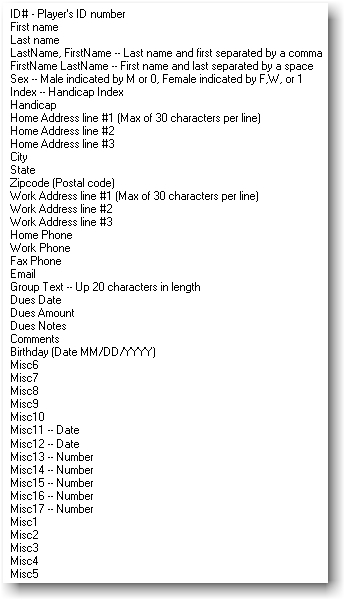 (All database/spreadsheet programs can save standard ASCII delimited files). If importing players into a roster, click the Membership Roster tab to view your membership roster. 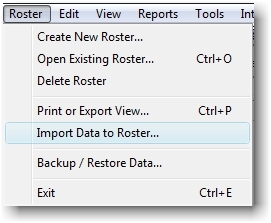 On the Roster menu, click Import Data to Roster. Click the Find Tournament Roster button. Select the roster to transfer information to. Click Next. Click the Find ASCII delimited file to import button. Select the file to transfer information from. A preview of the file will appear. You can further specify which row to start the import at. Click Next. Check the correct delimiter, comma, tab, space, or semicolon. A columnar preview will appear below. Also select the correct text qualifier. If the preview does not appear correct you may have saved your data in an ASCII delimited format that TM does not support. Click Next. Click the Finished button to start importing data. If importing players info into a tournament, click the Tournament Sheet tab to view your tournament. 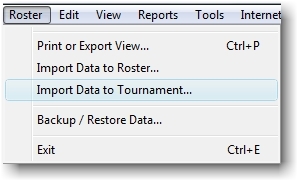 On the Roster menu, click Import Data to Tournament. If importing players info into a tournament, just click Next.